Raj Rani’s heart is failing. Lila sings at the bedside to soothe Edna’s troubles. A girl is looking for her father’s hug. Shiv has been given a second chance and an “upgrade”. 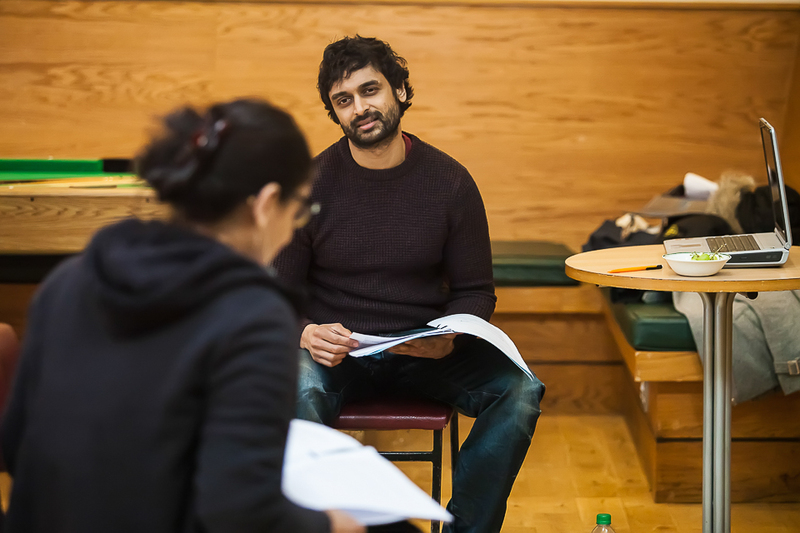 “When Sarah Weatherall, Arts Co-ordinator, from St George’s Hospital, approached me to contribute to their Annual Arts Event, it seemed natural to me to look at the subject of ‘Asian men and their hearts’ and my family’s connection to the hospital. Since my beloved younger brother Ajay had died suddenly in 2009 the age of 43, and having lost my father 35 years ago in a similar way, I wanted to highlight the higher incidence of heart problems in our community, particularly among the men. I interviewed patients from the Cardiology department at St George’s Healthcare NHS Trust, and was also inspired by the late Consultant Cardiologist Dr Charles Pumphrey, who had treated my husband and his two brothers as well as my mother. During the weeks that I was developing the piece, this issue was further crystallized in my personal life as my mum (who suffered her first heart attack in her fifties) was admitted to St George’s A&E on 1st April 2013. As I gathered stories from strangers, her heart too was failing. The piece I ended up writing was informed by this; my mum’s last weeks and a dear friend’s recovery from cardiac arrest and weeks of uncertainty. Sudha Bhuchar’s piece is a moving and thought provoking look at the inheritance of loss in her family which is mirrored in many Asian families. A combination of fractured, fictional scenes and verbatim material played out by actors Golden Hearts is in development. It was performed on 19th and 20th June 2013 in collaboration with Arts St George’s for their 10th Annual Arts Event at St George’s Hospital in London and on 27 March 2014 in collaboration with the British Heart Foundation at Rich Mix, London. In early 2016 Sudha Bhuchar was appointed ‘Artist in Residence’ at East London Genes & Health (ELGH). East London Genes & Health is the world’s largest long term community based genetic study which will analyse the genes and health of 100,000 people of Bangladeshi and Pakistani origin. East London boroughs, and Pakistani and Bangladeshi communities in particular, have some of the highest rates of poor health in the UK and the risk of dying early from heart disease is twice as high among South Asian groups compared with the general population. Tower Hamlets and Newham have the lowest life expectancy of all London Boroughs. Sudha’s family’s personal experience of the legacy of heart disease is mirrored in the communities in East London, who are the subject of ELGH’s study.